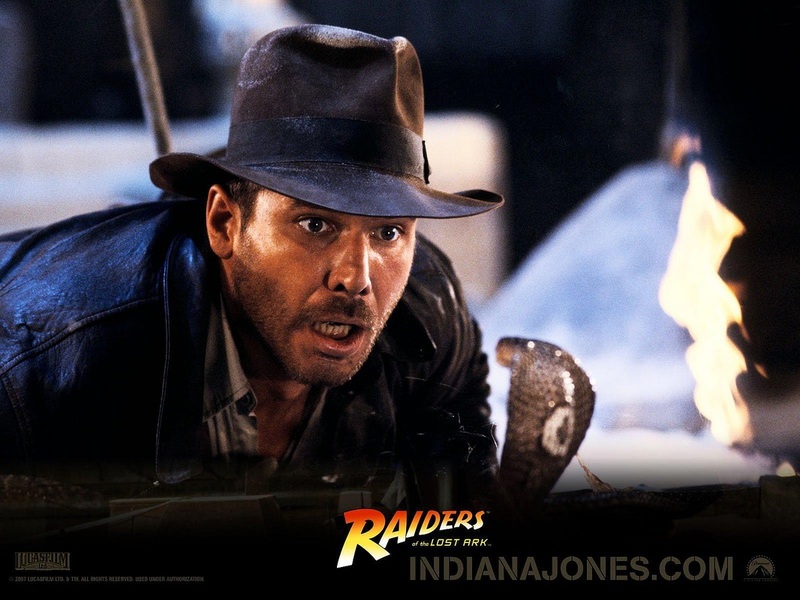 If adventure has a name…it must be "Indiana Jones"! Dr. Henry "Indiana" Jones, Jr. is a fictional professor of archaeology, adventurer, and the main protagonist of the 1981 adventure film Raiders of the Lost Ark, its prequel Indiana Jones and the Temple of Doom and sequels Indiana Jones and the Last Crusade and Indiana Jones and the Kingdom of the Crystal Skull. 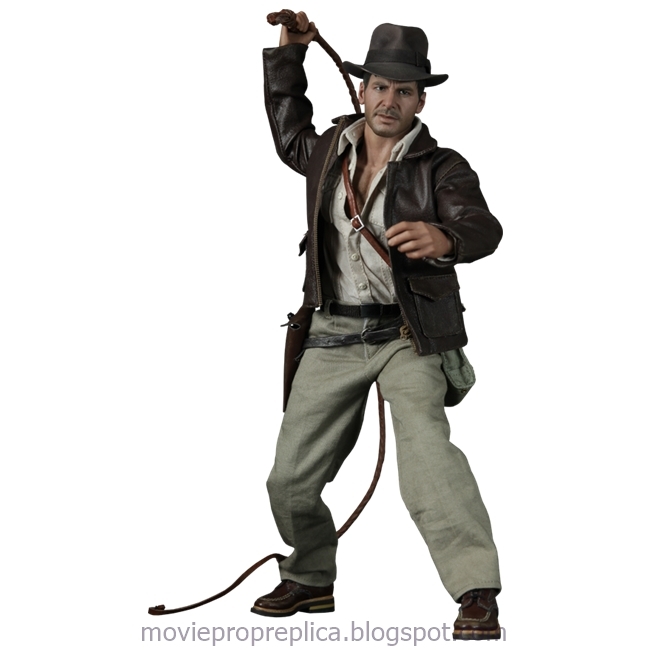 Jones is notable for his trademark bullwhip, fedora, leather jacket, and fear of snakes, and is most famously played by Harrison Ford. 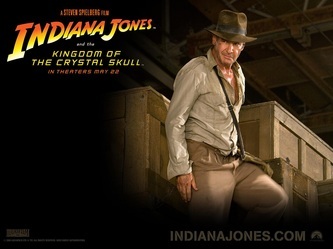 Indiana Jones races against agents of the Soviet Union, led by Irina Spalko (Cate Blanchett) for the crystal skull. Indy's journey takes him across Nevada, Connecticut, Peru, and the forest of the Amazon in Brazil. In the film. 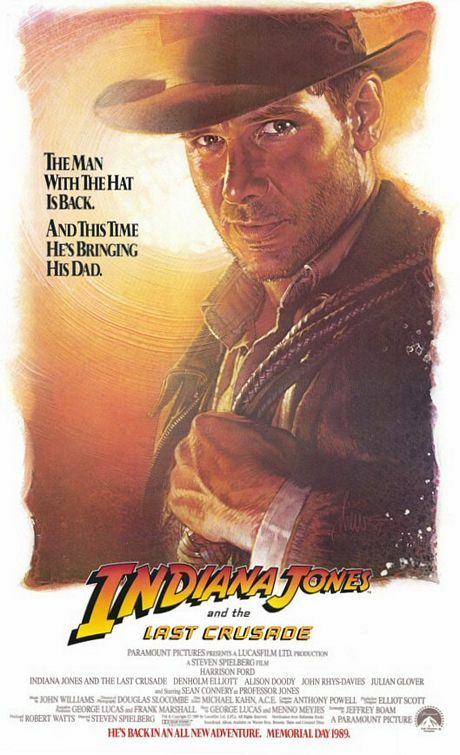 Indiana is faced with betrayal by one of his best friends, Mac (Ray Winstone), is introduced to a greaser named Mutt Williams (Shia LaBeouf), who turns out to be his son (real name revealed to be Henry Jones III), and is reunited with his old flame Marion Ravenwood. Opens in 1912 where a thirteen-year-old Indiana (River Phoenix) attempts to recover an ornamental cross belonging to Francisco Vásquez de Coronado, a task which he finally completes in 1938. 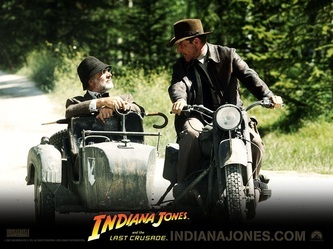 Indiana along with his friend Marcus Brody (Denholm Elliott) are assigned by American businessman Walter Donovan (Julian Glover) to find the Holy Grail. They are teamed up with Dr. Elsa Schneider (Alison Doody), following on from where Indiana's estranged father Henry (Sean Connery) left off before he disappeared. It turns out Donovan and Elsa are in league with the Nazis, who captured Henry in order to get Indiana to help them find the Grail. However, Indiana recovers his father's diary filled with his research, and manages to rescue him before finding the location of the Grail. 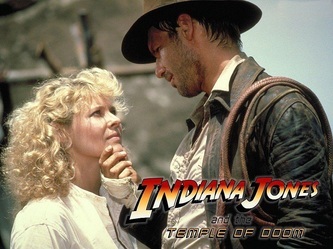 Both Donovan and Elsa fall to the temptation of the Grail, while Indiana and Henry realize that their relationship with each other is more important than finding the relic. Indiana escapes Chinese gangsters with the help of singer/actress Willie Scott (Kate Capshaw) and his twelve-year-old sidekick Short Round (Jonathan Ke Quan). The trio crash-land in India where they come across a village whose children have been kidnapped. A destructive cult led by Mola Ram (Amrish Puri) have also taken the holy Sankara Stones, which they will use to take over the world. 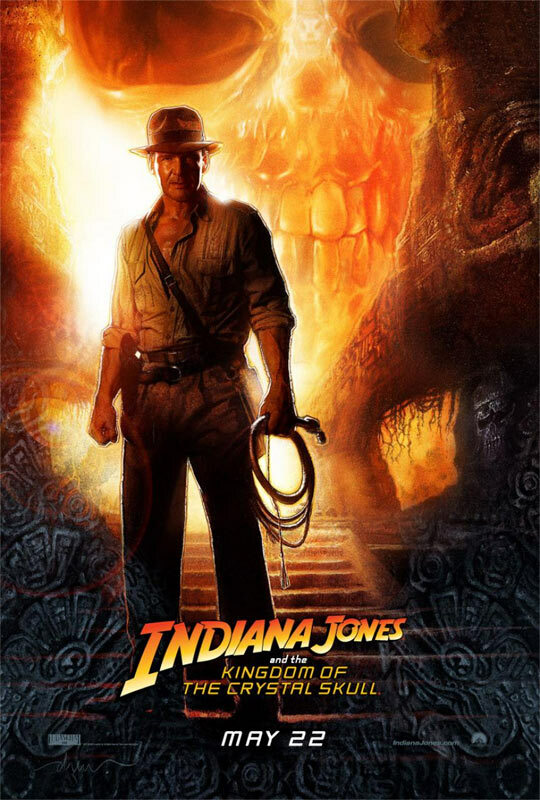 Indiana manages to overcome Mola Ram's evil power, and rescues the children and returns the stones to their rightful place, overcoming his own mercenary nature. 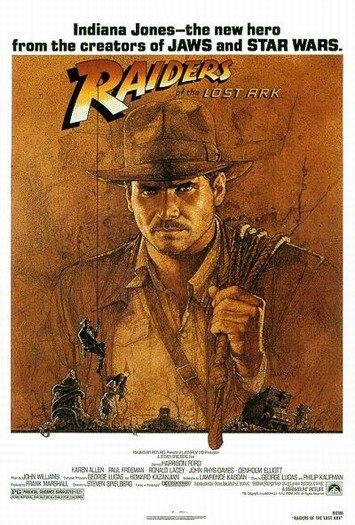 Indiana Jones (Harrison Ford) is assigned by government agents to locate the Ark of the Covenant before the Nazis do, to make them invincible like the Israelites in the Old Testament, who revered it as the dwelling place of God. The Nazis are being helped by Indiana's nemesis René Belloq (Paul Freeman). With the help of his old flame Marion Ravenwood (Karen Allen) and Sallah (John Rhys-Davies), Indiana manages to recover the Ark in Egypt. The Nazis manage to steal the Ark and capture Indiana and Marion. Belloq and the Nazis perform a ceremony to open the Ark, but when they do so, they are all killed gruesomely by the Ark's wrath. Indiana and Marion, who survived by closing their eyes, manage to get the Ark back to America, where it is stored in a secretive government warehouse. Indiana Jones Movie Prop Peplicas, Figures, Toys and Collectibles! Standing almost 12-inches tall, the intricate sculpting of this unbelievable piece is difficult to comprehend and appreciate until you've actually viewed it in person. The sides portray the incredible stone sculptures of the Peruvian shrine, and the top shows the infamous podium from the 1st scene in Raiders. With bullwhip flailing and idol in hand, Indy flees the temple with the legendary gigantic boulder hot on his heels. Lesser men have failed in their quest for this object… look no further than the grisly torso on the right! The detail in this diorama is simply stunning, and this statue will certainly be the centerpiece of any Indiana Jones collection! Positively overflowing with intricate detail on all sides, this magnificent sculpture stands about 12-inches tall and incorporates all of the legendary scenes from the film. 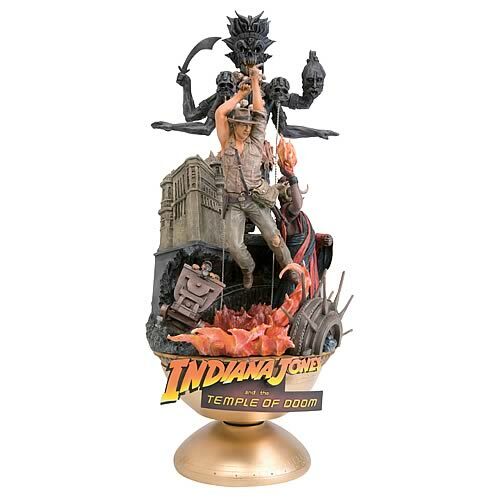 Indiana Jones swings to the rescue, Mola Ram holds a flaming heart, Short Round and Willie ride the out-of-control mine cart through the hidden caverns of Pankot Palace, while the statue of Kali looms over all. The menacing Kali is replete with real metal chains, machete, skulls, and multiple limbs… many of them disembodied. And, this mind-boggling Artfx Theatre Statue is fun to assemble! With unsurpassed quality and detailing, the snap-fit PVC kit can be easily put together in seconds without glue or modeling skill. Every fan-favorite scene is captured in this amazing sculpture measuring approximately 12-inches tall, and designed to be viewed from multiple angles, with each side revealing portions of the narrative. 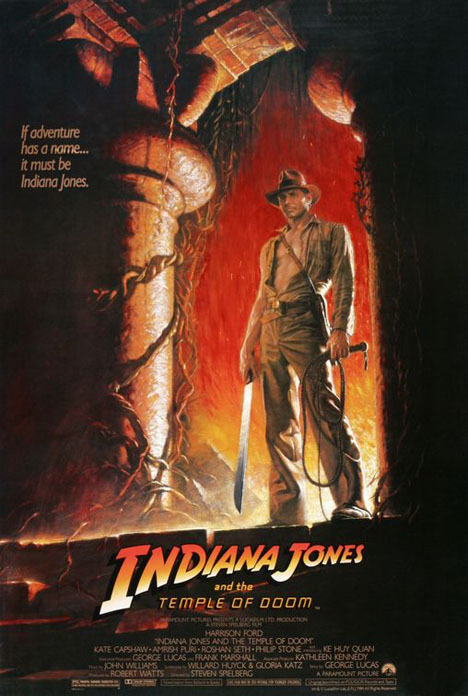 Centered around Indiana Jones on horseback, the ArtFx theatre features Professor Henry Jones alongside his Grail Diary, The Grail Knight with sword in hand protects the "cup of a carpenter", the German tank tumbles over the edge, while the final traps facing Indy are revealed on the opposite side. From the Manufacturer: Sideshow Collectibles and Hot Toys are proud to present the MMS DX 1/6th scale Indiana Jones Collectible Figure from the Indiana Jones - Raiders of the Lost Ark movie, a project made in collaboration with Sideshow Collectibles. The movie-accurate collectible is specially crafted based on the image of Harrison Ford as Indiana Jones, highlighting a newly developed head sculpt, two styles of specially produced costume, highly detailed accessories and weapons, as well as double-sided movie-accurate backdrop. Sporting a near-exact likeness of legendary actor Sean Connery, Dr. Henry Jones, Sr. is shown here in his dapper attire from the 3rd part of the saga, Indiana Jones and the Last Crusade. 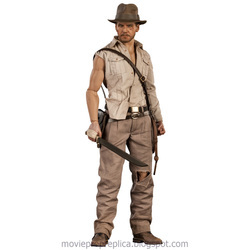 Dr. Jones stands almost 11-inches tall at 1:7 scale, as sculpted by Matsumoto-sensei. 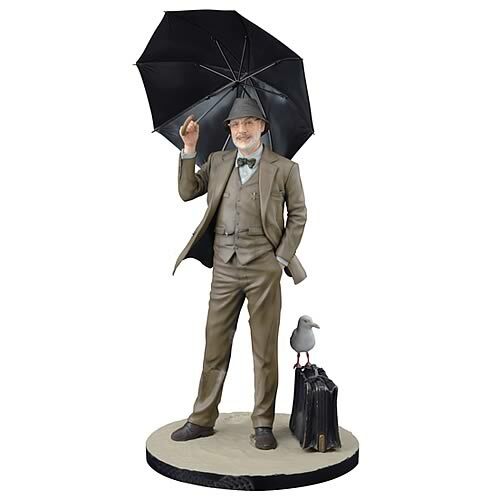 The good Doctor comes with 2 umbrellas-- one open and one closed-- to enhance your posing options. Just take care not to destroy any German fighter planes when doing so! With unsurpassed quality and detailing, this ArtFX Statue is a fun-to-assemble, snap-fit kit that can be easily put together in seconds without glue or modeling skill. From the Manufacturer: Sideshow Collectibles is proud to introduce the Indiana Jones 'Pursuit of the Ark' statue. Capturing the memorable scene from Raiders of the Lost Ark in stunning 1:5 scale, the newest addition to Sideshow's Indiana Jones collection is individually hand painted and finished with incomparable attention to detail. 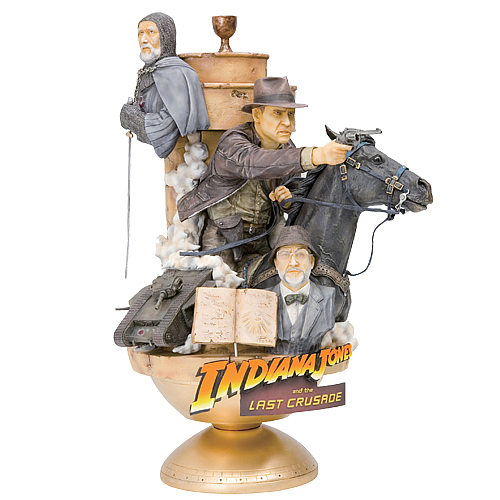 Measuring an impressive 23 inches tall, atop his borrowed steed, the Indiana Jones Pursuit of the Ark statue makes a noteworthy display for any Indy fan. If adventure has a name…it must be Indiana Jones. And if craftsmanship has a name…it must be Kotobukiya. 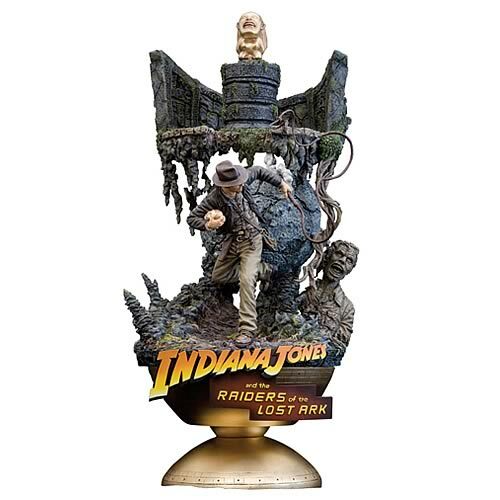 The two finally come together with the release of a new series of high-end collectibles covering all installments of the worldwide phenomenon – incluing the fourth film: Indiana Jones And The Kingdom Of The Crystal Skull. 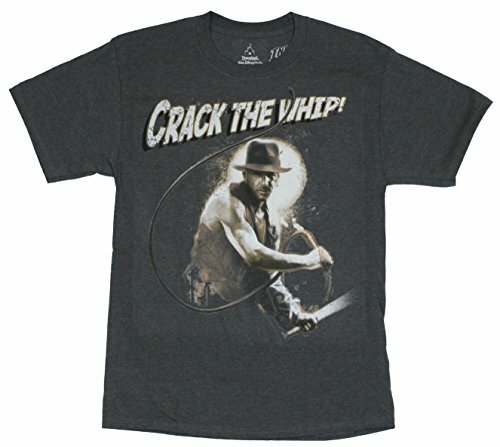 From the classic Raiders of the Lost Ark, comes an iconic rendition of the greatest action hero of all time: Indiana Jones. His special brand of two-fisted archeology is captured as a detailed 10 2/3” ArtFX Statue (1/7th scale – the exact same size as Koto’s renowned series of Star Wars ArtFX Statues). 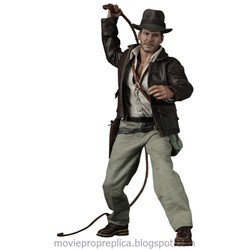 Indy’ trademark Fedora is removable, and his bullwhip is bendable. 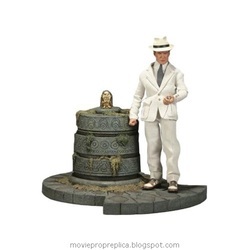 You can switch out Indy’s arms so that he can be displayed with his Smith and Wesson pistol, and tucked under his arm is the golden Chachapoyan Fertility Idol. 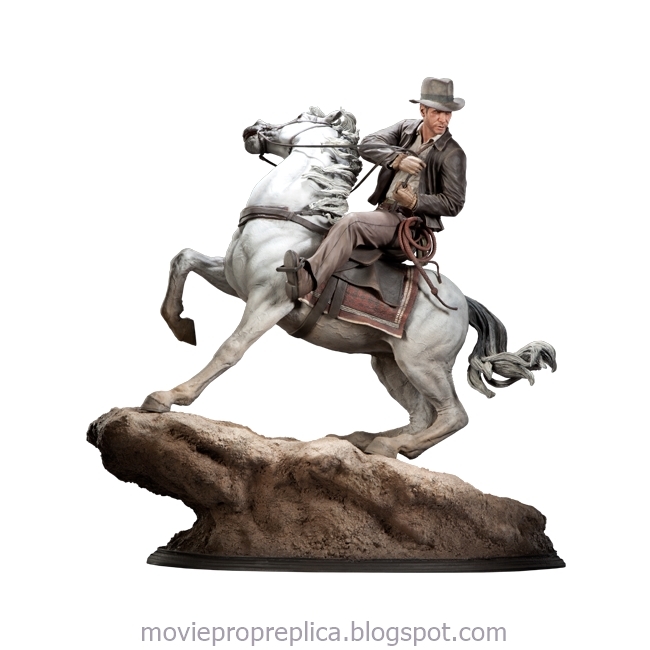 Jones is sculpted by Kouei Matsumoto, and is on a display base depicting the rocky floor of the Peruvian temple. 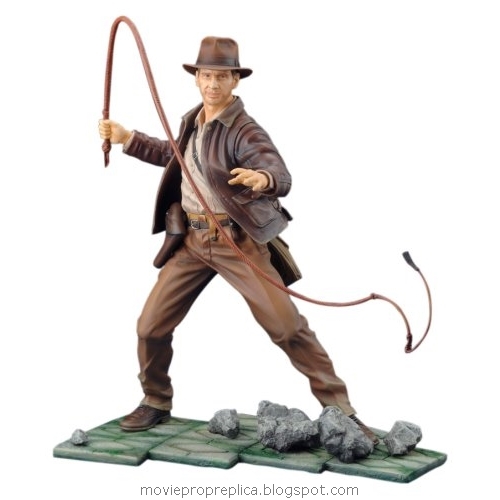 The movie-accurate collectible is specially crafted based on the image of Harrison Ford as Indiana Jones in the movie. From the Manufacturer: Capturing Harrison Ford as the world-famous archaeologist, relive your favorite moments from one of Indy’s most memorable expeditions with the Sideshow Collectibles Indiana Jones Temple of Doom Sixth Scale Figure. 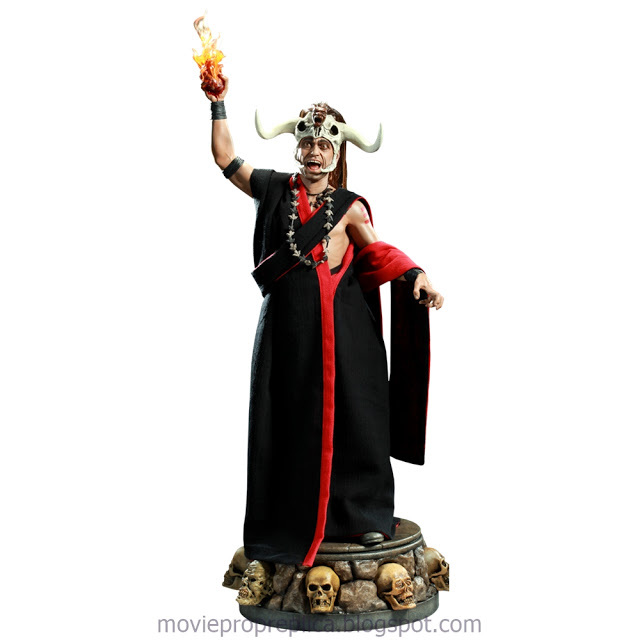 From the Manufacturer: The Mola Ram Premium Format figure presents one of Indiana Jones' most memorable adversaries in stunning detail. Each piece is individually painted and finished to exacting standards, each with its own unique quality and detail that is the trademark of a handcrafted Sideshow Collectibles product. Clothed in real fabric robes and wearing two detailed necklaces, Mola stands over 25 inches tall atop a base adorned with eight unique skulls. Mola Ram comes complete with two switch-out heads, featuring a headdress option with real hair detailing, and two switch-out hands, including a human heart engulfed in flames. The Mola Ram Premium Format Figure is the perfect addition to any display, an essential part of your Indiana Jones collection. 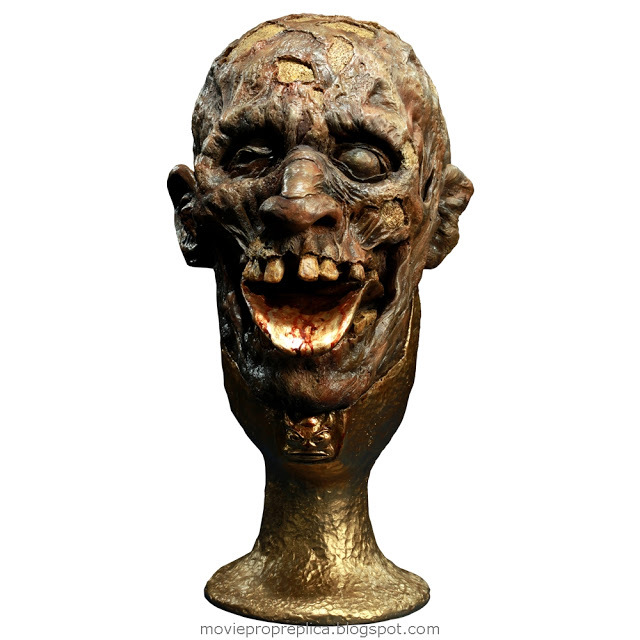 From the Manufacturer: Sideshow is proud to bring you the Chalice of Kali Prop Replica from 'Indiana Jones and the Temple of Doom'. Each piece of this full scale replica is individually painted and finished, each with its own unique quality and detail that is the trademark of a handcrafted Sideshow Collectibles product. 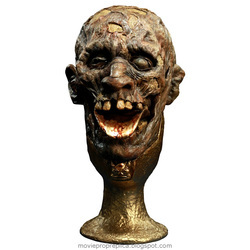 The Chalice of Kali Prop Replica is the definitive Indiana Jones collectible, the perfect addition to any display. Jones is most famously played by Harrison Ford. Particularly notable facets of the character include his iconic look (bullwhip, fedora, and leather jacket), sense of humor, deep knowledge of many ancient civilizations and languages, and fear of snakes. Indiana Jones remains one of cinema's most revered movie characters. Sean Connery as Professor Henry Jones: Indiana's father, a professor of Medieval literature who cared more about looking for the Grail than raising his son. a spirited, tough former lover of Indiana's. An American nightclub singer working in Shanghai. Willie is unprepared for her adventure with Indy and Short Round, and appears to be a damsel in distress. She also forms a romantic relationship with Indy. Jones' arch nemesis, Belloq is also an archaeologist after the Ark, but he is working for the Nazis. He intends to harness the power of the Ark himself before Hitler could, but he is killed by the supernatural powers of the Ark. A demonic Thuggee priest who performs rituals of human sacrifices.